On-line searches are the most popular approach. Google Scholar and ResearchGate are the favored applications. 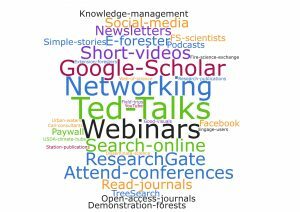 Google Scholar is a web-crawler, indexing content across most peer-reviewed on-line academic journals and many other technical documents. ResearchGate is a networking site for researchers, who upload publications to share, seek and provide answers to questions, and search for potential collaborators. Some professionals lose the ability to read scientific journal articles as they progress in their careers. Because daily calendars get filled and unplanned activities pop up, many later-career professionals no longer can have the uninterrupted block of time needed to read newly published scientific journal articles. So they either assign subordinates to read and provide a summary or they contact the scientist directly to discuss the findings. Watching hour-long webinars is declining in value to professionals; shorter videos are much preferred. Hour-long webinars are difficult to fit into crammed daily schedules—even for early-career professionals. Many are too stiff, formal, and uncreative to retain viewers’ full attention. Often, multi-tasking starts after 6-8 minutes. Dividing their attention limits learning and retention and reduces the quality of multi-tasked work. Shorter videos have emerged as much more useful and helpful, particularly when they are well-prepared yet presented using informal formats (e.g., TED Talks1). Professionals like to talk directly with researchers—at meetings, on field trips, by phone. Away from the office, later-career professionals can give their undivided attention to the speaker. Meetings also offer opportunities to discuss science both with the researchers presenting papers or posters and with one’s peer network. Learning from one’s network is vitally important to experienced professionals. Science users later in their careers and at higher levels of organizations don’t hesitate to contact scientists directly. Electronic newsletters have devoted followers because they compile, digest, and translate complex science findings into simpler language that is more easily understood. Scientists earlier in their careers read e-newsletters to see recent results they might have missed and find others doing work like theirs (expand their networks). They also send articles to editors to get reviewed and hopefully boost their reputation. Scientists later in their careers read e-newsletters because the editor does much of the hard work of digesting, synthesizing, and translating the scientific findings into simpler, more comprehensible language. Journals’ fees and embargo policies can restrict access to fresh science and delay its usage and impact. Journal articles that are inaccessible unless a fee is paid (“pay-per-view”) have less impact than science that is openly accessible and able to be read on-line. Many public agencies and non-governmental organizations can’t afford the fees. “Green” open access policies provide better and cheaper accessibility than “Gold” open access. Journal embargo policies—often 12 to 24 months—limit the ability of authors to circulate printed versions of their articles, forcing interested readers to either be journal subscribers or pay a fee to read the article. Researchers desiring to create the largest, fastest impact of their new scientific findings on resource management and policy decisions need to use additional dissemination methods besides publishing journal articles. Science-producing institutions need to rethink strategies, approaches, and business models for disseminating the results of their researchers’ projects. Changing technologies support different online search preferences and science delivery mechanisms. Professionals early in their careers are using approaches that are different from those later in their careers. Publishing in peer-reviewed journals, although important to verify quality, is insufficient as the sole science dissemination tactic because paywalls and embargo policies limit the accessibility of science to important segments of the population of natural resources professionals who use science daily. Communications professionals, who know how to use cutting-edge technologies, can help by putting science into easy-to-understand formats and in places where natural resources professionals and curious, interested members of the public can quickly find it. Traditional approaches to disseminating science are falling out of favor and into obsolescence—perhaps more quickly than many researchers, research communicators, and research leaders realize. See also: Guldin, Richard W. 2018. How do professionals find the science they need? Jour. For. 116(5):451-459. doi: 10.1093/jofore/fvy036. 1 See https://storage.ted.com/tedx/manuals/tedx_speaker_guide.pdf and the TED Commandments at https://patheos.com/blogs/tonyjones/2010/02/19/the-ted-commandments-rules-every-speaker-needs-to-know/.